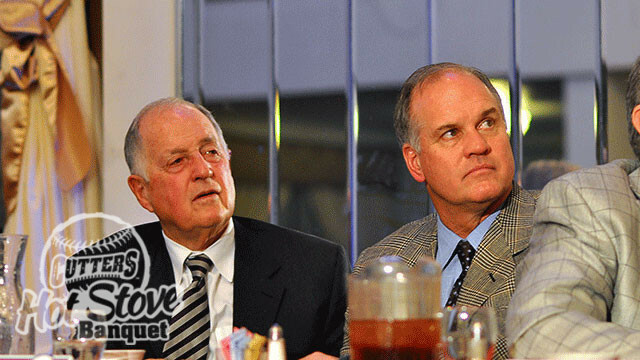 With a guest list that included two hall of famers, a World Series MVP and a former 30-game winner and a sold out Genetti Ballroom, the Williamsport Crosscutters 9th Annual Hot Stove Banquet was a great success while raising over $6,000 for charity. Phillies manager Ryne Sandberg, former Phillies GM Pat Gillick, former World Series MVP Pat Borders & legendary pitcher Denny McLain entertained attendees with stories, signed autographs and answered audience questions. In talking about the 2015 Phillies, Sandberg stated, "We are rebuilding and we'll have a lot of changing faces but at the same time it will be exciting watching a new core of players develop for the team. We have to start the process of getting younger." The night, presented by Lycoming Mall, Woodlands Bank, WRAK Radio and the Williamsport Sun-Gazette, was also highlighted by auctions that featured a wealth of sports memorabilia including a bat and jersey signed by Sandberg, a special breakfast with the Phillie Phanatic, a special VIP Package to a Phillies vs. Yankees game and much more. A portion of the proceeds from the evening were donated to the American Rescue Workers whose mission is to give spiritual and material aid to those in need. At the conclusion of the festivities, the Rescue Workers were presented with a check for $6,175 which represents the largest-ever donation from this event. The Crosscutters open the 2015 season on June 19 at State College with the home opener slated for Saturday, June 20 against the Spikes at Susquehanna Bank Park. Season tickets, Bonus Books and group packages are currently available and can be purchased online at www.crosscutters.com or by calling the Cutters at (570) 326-3389.